The Halifax waterfront submarine playground is a pretty amazing structure and my kids cite it as one of their favourites to play on. We live in the suburbs so when we take a trip downtown we always make sure to include it in our trip. When I was part of creating the 150 Coolest Playgrounds in Canada list (you can read more about that here), this was a no-brainer to include. That being said *looks around to make sure no one is listening* I don't actually like it much myself. I know. I feel like it's anti-Halifax to say that as so many of my out-of-town friends love it so much, but I've discovered that I'm not alone. YES, it's super cool. YES, it looks fantastic and fits in well with the look of the waterfront. And, YES, even my own children love it. But I don't. My main issues with it are that it seems like it was more designed for the look than the functionality and it just doesn't have enough to do for the crowds it draws. Now that I've got my personal opinion out of the way, let me tell you what it does have! It has one tall slide from the top of the submarine to the bottom. ...and the other access point is from the rope climbing structure at the back of the ship. It has three bouncy whales that always have a line-up of kiddos eager to ride them. It has two mini submarines - or are they mechanical fish?? - that two kids can play with at a time. The subs come complete with levers and buttons to feel like you're really operating the submarine! It is full of bright colours and I particularly love the ocean themed mural at the back. 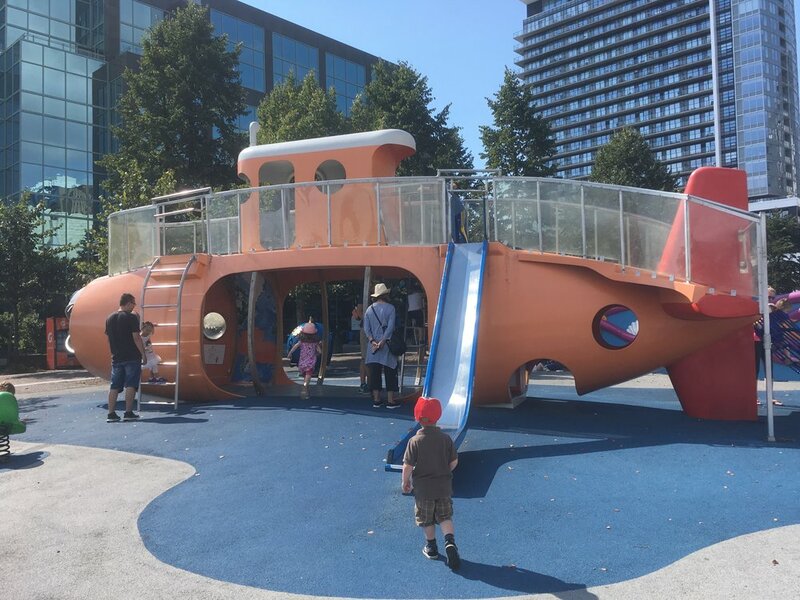 This playground is really rich for imaginative play - being a submarine captain, finding hidden gems like a steel starfish attached to a rock, and the setting is, of course, stunning. Kids can pretend they're really sailing on the ocean with the ocean view across from them. 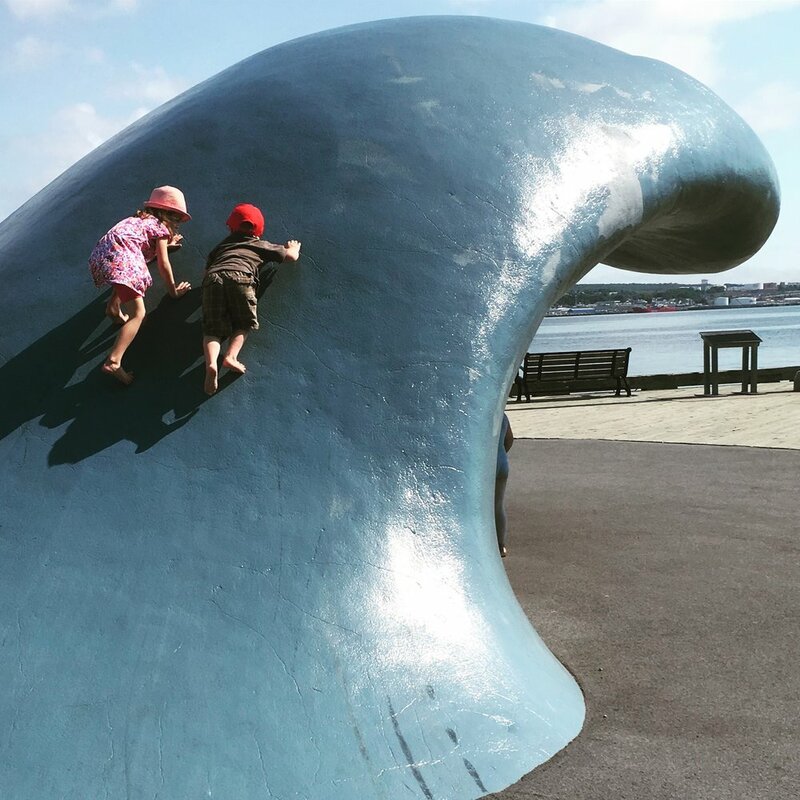 At our recent visit the kids also had their first climb on The Wave, the art sculpture located directly across from the playground. This is a little controversial and I wrote about why it's controversial here, but we let our kids do it within certain boundaries appropriate for their age and we all lived to tell the tale. It's clearly something you need to decide if you're comfortable allowing your child to do however. The playground is located next to the Maritime Museum of the Atlantic (1675 Lower Water Street) and the Visitor Information Centre on the Halifax Waterfront.